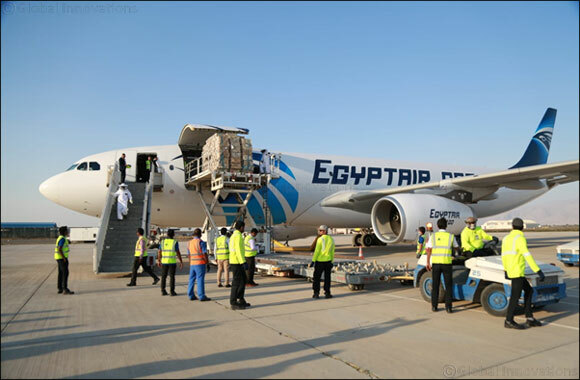 Dubai, UAE, March 25, 2019: On Thursday, March 14th, 2019, 40 tons of live honeybees landed at Ras Al Khaimah International Airport on an Egypt Air Cargo flight from Cairo for the first time in 2019. Many customers were waiting to welcome the bees and take them to various farms across the UAE. Al Najeh Honey entrusted Ras Al Khaimah International Airport (RAK) with this task and the entry of the honeybees to UAE was executed flawlessly by RAK airport offering best handling services thereby ensuring that the honey bee shipment is delivered and handed over to the consignee in the shortest possible time. Mr Sanjay Khanna, CEO, RAK Airport said that “the entire team at RAK Airport put in immense efforts to join all the dots together. Lot of planning has gone behind this to achieve the final goal of handling and delivering live bees. It has been our endeavor to establish benchmark standards in our airport. Moreover, our airport is perfectly suited to handle such delicate and time sensitive cargo.” We are grateful to Mr Wagih Habeeb, Country Head, Mr Sherif Sabry, General Manager from Egypt Air Cargo and Mr Mohamed Najah, Chairman of Al Najeh Honey & Bees Trading for giving us the opportunity to demonstrate our capabilities in this regard. We would also like to thank the Ministry of Environment and Climate Change, RAK Customs and other authorities for their quick and timely support provided. Al Najeh Honey farm started as a small trading business 26 years ago and since then begun raising and exporting queen bees and apiary equipment. The apiary is located in a remote desert property surrounded by a rickety barbed wire fence which holds 100 hives, each discreetly stored along the shady trees in locked plastic chests filled with trays of honeycombs guarded by thousands of bees. Al Najeh Honey owns and operates farms all through Egypt, Saudi and UAE, mostly in the Northern Emirates near Al Dhaid. Today, Al Najeh Honey has grown to be the largest bee supplier in the world using airfreight and transporting approx. 4.8 billion bees between Egypt, UAE, Oman, Sudan and Saudi Arabia. Mr Najah is closely associated with the Apex Body of Apiculture, APIMONDIA.